^ Compare: Chisholm, Hugh, ed. (1911). "Blücher, Gebhard Leberecht von" . Encyclopædia Britannica. 4 (11th ed.). Cambridge University Press. 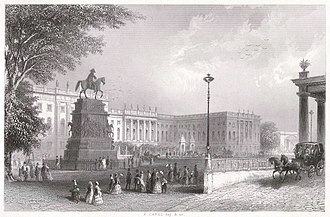 p. 90. : "He retained to the end of his life that wildness of character and proneness to excesses which had caused his dismissal from the army in his youth, but however they may be regarded, these faults sprang always from the ardent and vivid temperament which made Blücher a dashing leader of horse." The Order of Saint George is today the highest purely military decoration of the Russian Federation. Originally established November 26,1769 as the highest military decoration of the Russian Empire by Empress Catherine the Great and it was revived in the Russian Federation on August 8,2000 by Decree №1463 of the President of Russia. The current award criteria were amended on September 7,2010 by Presidential Decree 1099, the Order of Saint George is divided into four classes, from the First Class to the Fourth class, the highest degree being the Order First class. The four classes are awarded sequentially from the fourth to the first and these four classes are individually identified by the size and manner of wearing the two principal insignia of the Order, the cross and the star. Cross, A white enamelled cross pattée with a medallion bearing the image of Saint George on horseback slaying the dragon. The cross measures 60mm across in the case of the Order first class and is worn on a sash in the colours of Saint George. The same 60mm cross is worn around the neck on a 45mm wide ribbon in the colours of Saint George for the Order second class. The cross is 50mm across for the Order third class and is worn around the neck. The Order fourth class is a 40mm cross worn on the left breast hanging from a pentagonal mount covered with a 24mm wide ribbon of Saint George, the star is worn on the left breast for both the Order first and second classes. Ribbon, The ribbon of the Order of Saint George is orange with three stripes, commonly called Georges Ribbon. It symbolises fire and gunpowder, the Russian colors of military glory and it was subsequently associated to the colors of the Russian Guard units. Unlike the other classes, the Order of Saint George fourth class can be awarded to junior officers while the rest is for senior and flag officers. When an individual is entitled to use multiple post-nominal letters, those of the Order of Saint George appear before all others, except Bt or Bart, the ribbon bar for the Order first class is adorned with a miniature golden star. Legnickie Pole is a village in Legnica County, Lower Silesian Voivodeship, in south-western Poland. It is the seat of the district called Gmina Legnickie Pole. It lies approximately 10 kilometres southeast of Legnica, and 56 kilometres west of the regional capital Wrocław, the village has a population of 780. 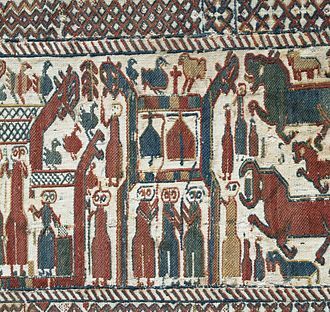 The village was the site of the decisive Battle of Legnica on 9 April 1241, in the battle, Mongols of the Golden Horde led by Kadan and Baidar defeated a Polish-German army under Duke Henry II the Pious of Silesia. The battle marked the westernmost expansion of the Mongols into central Europe, from 1335 until 1742 it was part of the Kingdom of Bohemia and thus of Austria. 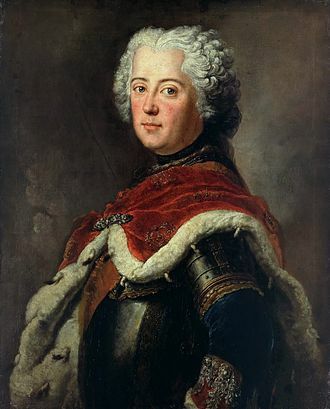 The village became part of the Kingdom of Prussia during the 18th century Silesian Wars in 1742, in honor of this victory Blücher received the title Prince of Wahlstatt on 3 June 1814. The village became part of Peoples Republic of Poland following World War II, had its German-speaking population expelled, in the old village church is the museum of the battle of Legnickie Pole. Rostock is the largest city in the north German state Mecklenburg-Vorpommern. Rostock is on the Warnow river, the district of Warnemünde 12 kilometres north of the city centre is directly on the Baltic Sea coast, Rostock is home to one of the oldest universities in the world, the University of Rostock, founded in 1419. The city territory of Rostock stretches for about 20 km along the Warnow to the Baltic Sea, the largest built-up area of Rostock is on the western side of the river. The eastern part of its territory is dominated by industrial estates, Rostock is considered as the only regiopolis in Mecklenburg-Vorpommern. 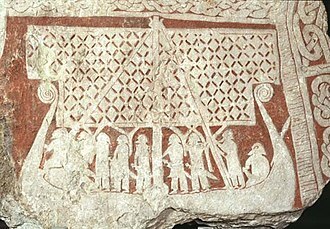 In the 11th century Polabian Slavs founded a settlement at the Warnow river called Roztoc, the Danish king Valdemar I set the town aflame in 1161. 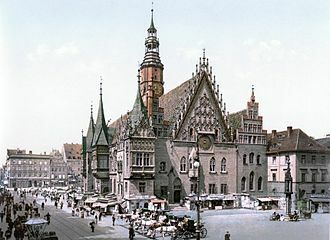 Afterwards the place was settled by German traders, initially there were three separate cities, Altstadt around the Alter Markt with St. Petri, Mittelstadt around the Neuer Markt with St. Marien and Neustadt around the Hopfenmarkt with St.
Jakobi. 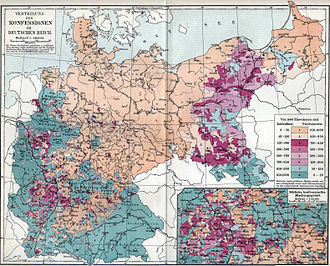 In 1218, Rostock was granted Lübeck law city rights by Heinrich Borwin, during the first partition of Mecklenburg following the death of Henry Borwin II of Mecklenburg in 1226, Rostock became the seat of the Lordship of Rostock, which survived for almost a century. 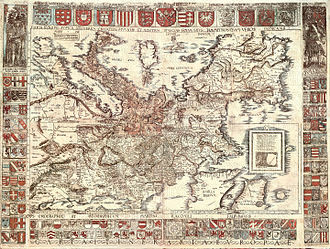 In 1251, the city became a member of the Hanseatic League, in the 14th century it was a powerful seaport town with 12,000 inhabitants and the biggest city of Mecklenburg. Ships for cruising the Baltic Sea were constructed in Rostock, the formerly independent fishing village of Warnemünde at the Baltic Sea became a part of Rostock in 1323, to secure the citys access to the Baltic Sea. 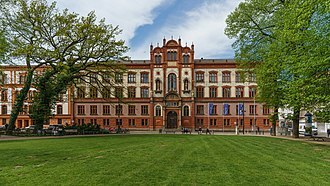 In 1419, one of the earliest universities in Europe, the University of Rostock, was founded and they took advantage of a riot known as Domfehde, a failed uprising of the impoverished population. Subsequent quarrels with the dukes and persistent plundering led ultimately to a loss of economic, in 1565 there were further clashes with Schwerin that which had far-reaching consequences. 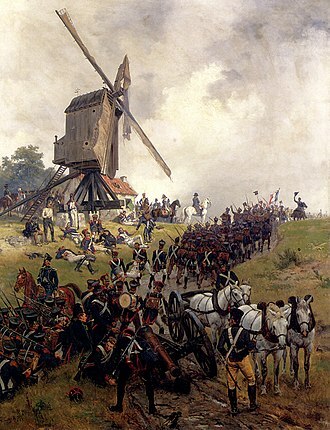 The Battle of Ligny was the last victory of the military career of Napoleon Bonaparte. 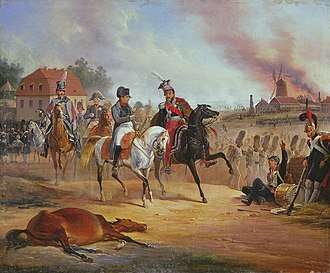 In this battle, French troops of the Armée du Nord under Napoleons command, defeated part of a Prussian army under Field Marshal Prince Blücher, near Ligny in present-day Belgium. However, had the French army succeeded in keeping the Prussian army from joining the Anglo-allied Army under Wellington at Waterloo, Napoleon might have won the Waterloo Campaign. If he could destroy the existing Coalition forces south of Brussels before they were reinforced, he might be able to drive the British back to the sea and knock the Prussians out of the war. The Duke of Wellington expected Napoleon to try to envelop the Coalition armies, the roads to Mons were paved, which would have enabled a rapid flank march. This would have cut Wellingtons communications with his base at Ostend, in fact, Napoleon planned instead to divide the two Coalition armies and defeat them separately, and he encouraged Wellingtons misapprehension with false intelligence. 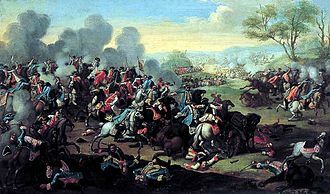 Only very late on the night of 15 June was Wellington certain that the Charleroi attack was the main French thrust, neys orders were to secure the crossroads of Quatre Bras, so that if necessary, he could swing east and reinforce Napoleon. As Napoleon considered the concentrated Prussian army the greater threat, he moved against them first, the centre and left wing together would make a night-march to Brussels. The Coalition forces would thus be irremediably sundered, and all that remained would be to them in detail. Ney spent the morning in massing his I and II corps, and in reconnoitring the enemy at Quatre Bras, but up till noon he took no serious step to capture the cross-roads, which lay at his mercy. Grouchy meantime reported from Fleurus that Prussians were coming up from Namur and he was still at Charleroi when, between 09,00 and 10,00, further news reached him from the left that considerable hostile forces were visible at Quatre Bras. 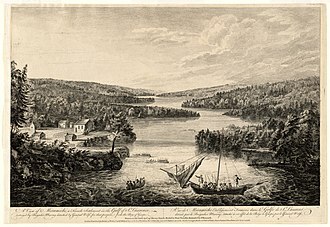 Then, keeping Lobau provisionally at Charleroi, Napoleon hastened to Fleurus and it was a position that had been previously and found to be one of most suitable, in the event of Napoleons adoption of a line of operations across the Sambre at Charleroi. The Battle of Waterloo was fought on Sunday,18 June 1815, near Waterloo in present-day Belgium, part of the United Kingdom of the Netherlands. Upon Napoleons return to power in March 1815, many states that had opposed him formed the Seventh Coalition, Wellington and Blüchers armies were cantoned close to the north-eastern border of France. 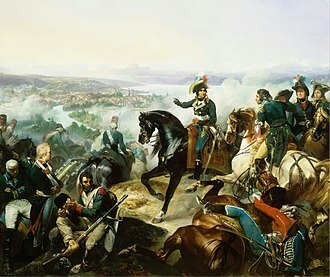 Napoleon chose to attack them in the hope of destroying them before they could join in an invasion of France with other members of the coalition. 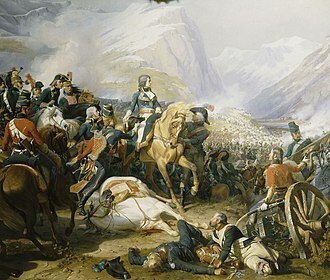 Despite holding his ground at Quatre Bras, the defeat of the Prussians forced Wellington to withdraw to Waterloo, Napoleon sent a third of his forces to pursue the Prussians, who had withdrawn parallel to Wellington. This resulted in the separate and simultaneous Battle of Wavre with the Prussian rear-guard, upon learning that the Prussian army was able to support him, Wellington decided to offer battle on the Mont-Saint-Jean escarpment, across the Brussels road. Here he withstood repeated attacks by the French throughout the afternoon, in the evening Napoleon committed his last reserves to a desperate final attack, which was narrowly beaten back. With the Prussians breaking through on the French right flank, Wellingtons Anglo-allied army counter-attacked in the centre, Waterloo was the decisive engagement of the Waterloo Campaign and Napoleons last. According to Wellington, the battle was the thing you ever saw in your life. Napoleon abdicated four days later, and on 7 July coalition forces entered Paris, the defeat at Waterloo ended Napoleons rule as Emperor of the French, and marked the end of his Hundred Days return from exile. 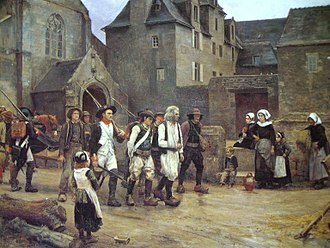 This ended the First French Empire, and set a chronological milestone between serial European wars and decades of relative peace, the battlefield is located in the municipalities of Braine-lAlleud and Lasne, about 15 kilometres south of Brussels, and about 2 kilometres from the town of Waterloo. The site of the battlefield today is dominated by a large monument, as this mound was constructed from earth taken from the battlefield itself, the contemporary topography of the battlefield near the mound has not been preserved. On 13 March 1815, six days before Napoleon reached Paris, four days later, the United Kingdom, Russia and Prussia mobilised armies to defeat Napoleon. Crucially, this would have bought him time to recruit and train more men before turning his armies against the Austrians and Russians, an additional consideration for Napoleon was that a French victory might cause French speaking sympathisers in Belgium to launch a friendly revolution. Wellingtons initial dispositions were intended to counter the threat of Napoleon enveloping the Coalition armies by moving through Mons to the south-west of Brussels and this would have pushed Wellington closer to Blücher, but may have cut Wellingtons communications with his base at Ostend. 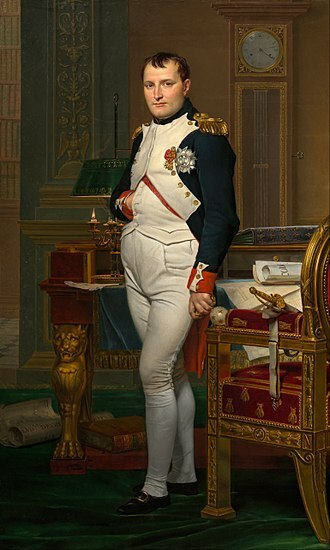 In order to delay Wellingtons deployment, Napoleon spread false intelligence which suggested that Wellingtons supply chain from the ports would be cut. By June, Napoleon had raised a total strength of about 300,000 men. The force at his disposal at Waterloo was less than one third that size, Napoleon divided his army into a left wing commanded by Marshal Ney, a right wing commanded by Marshal Grouchy and a reserve under his command. 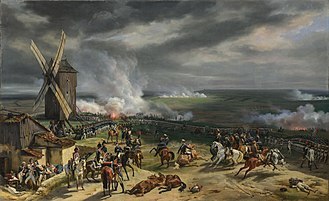 In the Battle of Bautzen a combined Russian/Prussian army was pushed back by Napoleon I of France, but escaped destruction, some sources claim, because Michel Ney failed to block their retreat. 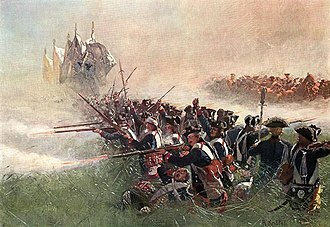 The Prussians under Count Gebhard von Blücher and Russians under Prince Peter Wittgenstein, the Prusso-Russian army was in a full retreat following their defeat at the Battle of Lützen. 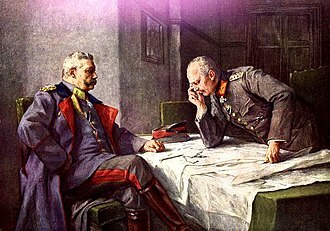 Finally, generals Wittgenstein and Blücher were ordered to stop at Bautzen by Tsar Alexander I, the Prusso-Russian army was nearly 100,000 men strong, but Napoleon had 115,000 troops. Additionally, Marshal Ney had 85,000 more men within easy marching distance, Wittgenstein formed two defensive lines, with the first holding strongpoints in villages and along ridges and the second holding the bridges behind a river bend. Napoleon had planned to pin down his enemies to their lines, due to faulty reconnaissance, he became concerned that the Prusso-Russians had more soldiers and held stronger positions than they actually did. So Napoleon decided he would not set up his trap until they had been softened up, after an intense bombardment by the grande batterie of Napoleons artillery and hours of heated fighting, the French overpowered the first defensive lines and seized the town of Bautzen. The Prusso-Russians appeared to be buckling, by nightfall, the French were ready to cut the allies off from their line of retreat. But Marshal Ney became confused and his faulty positioning left the open for the Allies to escape. 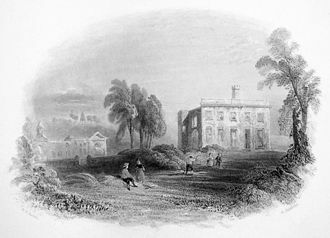 Fighting on the day, the 21st, was again hard and after several hours of setbacks. 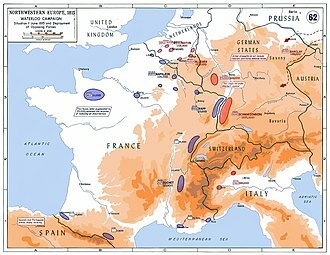 But these assaults were only intended to fix the allies in place so they could be cut off, once again, Marshal Ney became distracted and decided to seize the village of Preititz, and thus lost sight of the strategic importance of cutting off the allies. The Prusso-Russians were being pushed back across the river and, at 4 p. m. when the Imperial Guard was sent in, without Neys forces to seal them in, they again escaped the total defeat Napoleon had planned. A Hussar was a member of any one of several types of light cavalry used during the 18th and 19th centuries, beginning in Central Europe. Historically, the term derives from the cavalry of late medieval Hungary, the title and distinctive dress of these horsemen were subsequently widely adopted by light cavalry regiments in European and European colonial armies in the late 17th and 18th centuries. 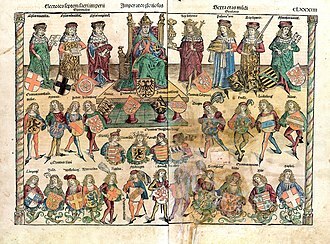 A number of armored or ceremonial mounted units in modern armies retain the designation of hussars, the first written mention of the word Hussarones has been found in documents dating from 1432 in Southern Hungary. A type of light horsemen was already well-established by the 15th century in medieval Hungary. 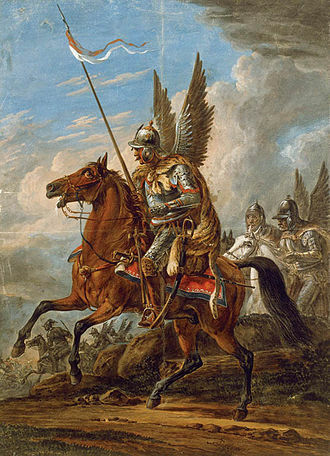 Etymologists are divided over the derivation of the word hussar, byzantinist scholars argue that the term originated in Roman military practice, and the cursarii. 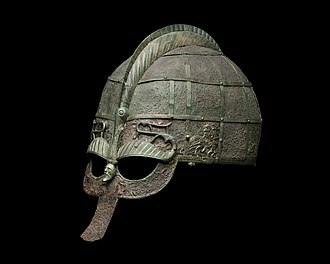 10th-century Byzantine military manuals mention chonsarioi, light cavalry, recruited in the Balkans, especially Serbs and this word was subsequently reintroduced to Western European military practice after its original usage had been lost with the collapse of Rome in the west. According to Websters Dictionary, the word stems from the Hungarian huszár. On the other hand, husz means twenty in Hungarian whilst ar is a unit of measurement or acre. Hussars are so named as they were a form of military levy whereby any land owner with twenty acres was duty bound to provide a mounted and equipped soldier to the army at their own expense. The elaborate uniforms were based on traditional Magyar horsemans clothes with highly braided, tight riding breeches, close fitting pointed boots, the hussars reportedly originated in bands of mostly Serbian warriors, crossing into southern Hungary after the Ottoman conquest of Serbia at the end of the 14th century. Regent-Governor John Hunyadi created mounted units inspired by the Ottomans and his son, Matthias Corvinus, king of Hungary, is unanimously accepted as the creator of these troops, commonly called Rac. Initially, they fought in bands, but were reorganised into larger. The first hussar regiments comprised the cavalry of the Black Army of Hungary. Rostock University, the oldest university in continental northern Europe and the Baltic Sea area, founded in 1419. Battle of Hohenfriedberg – Attack of Prussian Infantry, 4 June 1745, by Carl Röchling. 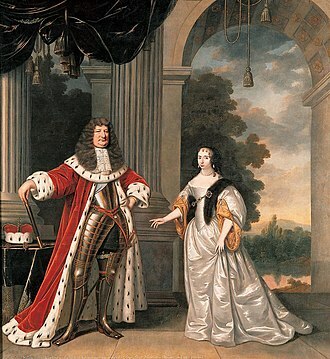 Frederick William, the "Great Elector". Brandenburg troops of the infantry regiment of Leopold I, Prince of Anhalt-Dessau, by Richard Knötel. 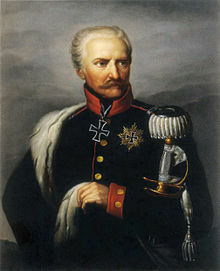 King Wilhelm I of Prussia wearing the 1813 Iron Cross 2nd class (with ribbon) and 1870 Iron Cross 1st class (on his chest). The larger Grand Cross (in his buttonhole), awarded in 1871, was the precursor to the Knight's Cross worn around the neck. Prince Bernhard of Lippe-Biesterfeld Knight Commander of the Military William Order. Six knights of the Military William Order at the Binnenhof (The Hague, Netherlands) on 29 May 2009. A Prussian officer informs the Duke of Wellington—who was attending the Duchess of Richmond's ball—that the French have crossed the border at Charleroi and that the Prussians would concentrate their army at Ligny. 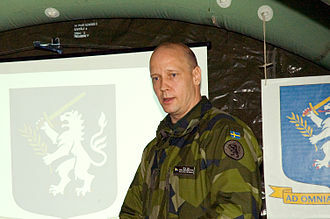 Maj. Gen. Karl Engelbrektson is the current Chief of Army. Swedish soldiers during a training exercise. Battle of the Katzbach by Eduard Kaempffer. Battle of Katzbach by Klein. 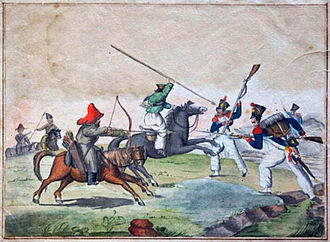 Prussian troops force the French into the river. Prussian marshal's baton, awarded to Emperor Franz Joseph I of Austria in 1895.